I read and responded to Amy’s ENGL894 Locklear Case Study 2 Outline and to Jenny’s Exploring the Flow of Information in LLL via Rhetorical Situation and Genre Theory. Each took a different approach to the application of theories to object of study from each other and from the one I took in my outline, and I found that difference instructive and reflective of the continued emphasis our theorists place on difference in discursive formation. Both Amy and Jenny took a more formal approach to the outline than I did. Their outlines included the standard numbers and letters (mediated, I noticed, by Microsoft Word’s formatting expectations and defaults, a particular pet peeve of mine), while my outline consisted of a table that (I hope) functions as an operationalized comparison and contrast rubric for the case study (mediated, I admit, by the focus on “compare and contrast” and a desire to place my theoretical conversants in a concrete framework). I also noticed that Jenny and Amy carefully examined and summarized the theories they seek to apply, while I more generally mentioned my applied theories and focused more attention on addressing the questions of the final assignment. In some ways I feel I shortchanged my outline (and I’ll regret that in the days leading up to March 23); in other ways, however, I’m working to convince myself that I directly addressed the expectations of the final assignment, important in a 3,000 word response that includes a brief literature review. I found Amy’s presentation of nodes and activity in MOOCs very different from what I expected. 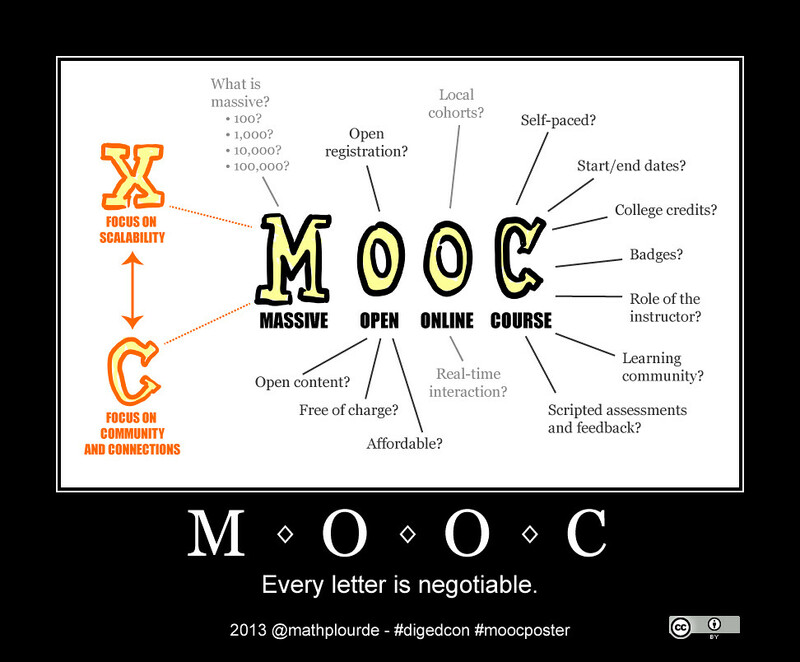 As I consider MOOCs, I gravitate toward the technology that makes MOOCs possible as network nodes and activity. It’s this focus on non-human members of the network that I especially appreciate about ANT. I found Amy’s focus on the pedagogical theory and human agents as nodes an interesting and useful boundary for her discussion. Ultimately, each of us seeks a boundary within which to develop a coherent theoretical application to our object of study. Amy’s boundary differs from the boundary I would choose, but that difference tells us something about our individual network and rhetorical experiences. It also makes class-sourced collaborative models of theoretical applications to networks more valuable, in my mind, to scholarship and to pedagogical outcomes. I have a sneaking suspicion that the two instructors are of the same mind in this conclusion. Jenny’s focus on ordering nodes in her outline was also unexpected. Throughout this semester, probably starting with Vatz, I’ve gravitated away from applying frameworks to theories (my tabular outline an obvious contradiction, alas). I’ve willed myself to avoid imposing order on the theoretical chaos in my head. Jenny’s outline was a refreshing shift, but one important aspect I noticed was that each “ordering” of nodes was dependent on the individual theory. Instead of using a set of common criteria (like my use of the assignment questions) by which to compare and contrast theoretical stances, she developed individual criteria for comparison based on her summarized analysis of the theories themselves. Doing so likely required more effort than a standardized set of comparison criteria, but the result is that she likely has a much clearer handle on each of the theorists’ main ideas as they relate to her object of study. 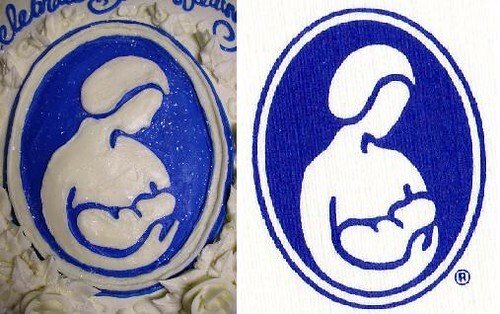 In both cases, I learned from each interpretation of the assignment. My “meta” moment has less to do with the theories or their application to objects of study and more to do with each of our different executions of the assignment itself. From a pedagogical standpoint, multiple interpretations of an assignment are difficult to assess in a rubric, but they better reflect many of our theorists’ perspectives on the importance of difference in discursive formation. That’s an important lesson for my own pedagogy. Lock, A. (2014, March 3). ENGL894 Locklear case study 2 outline [Google doc, outline]. Moore, J. (2014, March 2). Exploring the flow of information in LLL via rhetorical situation and genre theory [Google doc, outline]. For this week, I responded to Maury’s case study on a Foucauldian study of LARPing and Suzanne’s application of Genre Theory to the Underground Press Syndicate. I loved reading Maury’s case study because LARPing offers such a parallel and yet such a distinction to video games, especially in terms of human spontaneity. As I was reading her unraveling of the relationships between the nodes of playable character- non-playable character -Game Master – system – mechanics, there was definitely the sense that there is always a system in play of human activity that builds a discourse in itself. I really liked Maury’s analogy of the different kinds of trees, with her idea that LARPing was more like a Tree of Life with a cycle whereas Foucault’s was a branching tree with leaves. Her entry gave me a new perspective as it was a practical application of Foucault, which made his concepts much easier (if not completely clear) to understand. I enjoyed looking at the thought process she had going on as she was designing diagrams that evolved as she started to unpack her own analysis and application. Suzanne’s entry was especially enlightening as the intersections between the different Genre theorists we have read in class. Reading her work made me wonder about how I could deepen my own case study regarding World of Warcraft and the different kinds of genres and artifacts are being created when there really are no traditional texts in play in a virtual game. Her entry was also very insightful because I was introduced to the Underground Press Syndicate (something I had never stumbled on before) and the socio-cultural factors that went into play for its birth, continuance, and later its dissolution. I liked reading about the networks within the UPS and outwards towards other media outlets, its creation of artifacts and why those artifacts were so historically and culturally packed, and how the changing of technology and societal frames finally made the UPS outdated. After reading bother Maury and Suzanne’s entries, I wonder what a diagram of the network of WoW guilds would look like on both a game-local and game-global level. Would it include relationships among the players? Relationships among the guilds? Relationships among the guilds among the different servers? Would it be before guild perks were introduced? Only explore after guild perk emergence? Would it include before and after? I think doing each of these and connecting the diagrams slowly would be an insightful project (though extensive) because then I could then trace how players gain agency and to what extent they are permitted agency within their own guilds and the game at large. But, that would be for another day (or week…or month). Adding Spinuzzi this week, I began to see overlaps rather than contradictions. 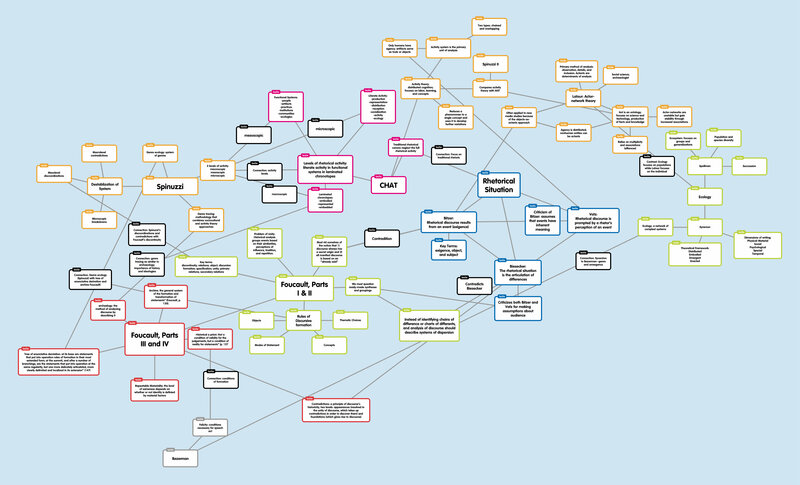 Even though last week was one of the Mind Maps to drop for me, I also added in a node for Bazerman as I saw a connection between his the felicity conditions he described and Foucault’s historical a priori that I didn’t want to forget. Although not exactly the same, I do think there are similarities between Spinuzzi’s genre ecology (system of genres) and Foucault’s concepts of archive (“the general system of the formation and transformation of statements”) and tree of enunciative derivation (“at its base are statements that put into operation rules of formation in their most extended form; at the summit, and after a number of branchings, are the statements that put into operation at the same regularity, but one more delicately articulated, more clearly delimited and localized in its extension”). While genre ecology and archive seem to both encompass the system as a whole, the tree seems to correlate with Spinuzzi’s three levels of activity within the system just as the tree describes levels within the archive. Additionally, Foucault’s methodology of tracing seems closely related to Spinuzzi’s, although Spinuzzi identifies a more systematic approach. Both emphasize the importance of understanding the historical and cultural/disciplinary roots of discourse/genre (which also relates to Popham’s boundary objects). Finally, I noted a connection between Foucault’s concept of discontinuity and Spinuzzi’s destablization. Again, both identify these as places of interruption–places that indicate the importance of understanding the various levels at play. I enjoyed reading Chvonne’s blog about Snapchat and Summer’s blog about MMOs (specifically WoW). For her case study, Chvonne applied mostly Bitzer’s theory of the rhetorical situation to Snapchat, focusing on how an event serves as the exigence for the Snapchat and how meaning is created primarily by the author of the Snapchat (interpretation of the event). In her case study, Summer applied Bazerman’s theory of genres to World of Warcraft (WoW), focusing players’s conformity to guild social rules and norms as “social facts” and interactions as speech acts. Considering these two analyses together makes me think about how meaning is created in different theories of networks. From Chvonne’s example of Snapchat and Bitzer’s theory, meaning seems to be created by the individual (I’d argue that it’s both the author of the Snapchat AND the audience-turned-author in response who create meaning in this application). Meaning is manipulated by individuals as they respond to the exigence. In contrast, Summer’s application of genre theory situates meaning as culturally-negotiated as party of the social system. Members of the network create the rhetorical situation and, thereby, the standards and norms of the network. Bazerman’s concepts of locutionary and illocutionary acts and perlocutionary effects account for the negotiations between the individuals that Bitzer’s theory neglects. Summer’s application of genre theory stirred me to think about the next case study and how I might begin to apply Bazerman’s concepts to my own Object of Study. If we consider the field of writing centers as a (global) social system in which individual writing centers create their own (local) social systems, we can begin to consider how the social facts of the global system not only dictate the speech acts of but are also transformed by the local systems. Genre tracing is based on activity theory and genre theory. Its methods study “the dynamic tension of centripetal and centrifugal impulses” (p. 22) of workplace information design. Centripetal impulses are centralized, generalized, official, and static methods and outcomes of information design, while centrifugal impulses are decentralized, localized, unofficial, and dynamic methods and outcomes of information design. Centripetal forces generate official versions of information design that are expected to be followed in workflow development and management in localized offices, while centrifugal forces generate unofficial workarounds to generalized design that does not work effectively or efficiently in specific localized environments. Spinuzzi claims that “genre tracing provides a way to highlight users’ experience with official and unofficial genres and to compare them across communities and workplaces” (p. 22). I visualized the relationship between centripetal and centrifugal impulses on a continuum, including Bakhtin’s (1981, 1986) ideas on centripetal impulses metaphorically drawing things inward and centrifugal impulses metaphorically flying away toward chaos. The central concern of Spinuzzi’s text and method is to avoid the pitfalls of “designer-as-rescuer” assumptions made in fieldwork-to-formalization user-centered design methods. Spinuzzi frames workers as innovators who develop genre- and hierarchy-crossing methods for solving problems of centralized information design. Spinuzzi develops an integrated research scope for examining localized workplace innovations in terms of three “layers”: activity, actions, and operations (p. 27). This integrated scope examines genre operations that coconstitute “cultural activities and goal-directed actions” (p. 27). This scope does not treat individual layers as a singular focus (a downfall he finds among most user-centered design methods, (p. 30)), but as “integrative perspectives” following concepts introduced by activity theorists Kari Kuutti and Liam Bannon (1991, 1993), among others (p. 29). Spinuzzi uses the terms macroscopic, microscopic, and mesoscopic to describe these three integrative layers that work together to coconstitute activity and actions (pp. 31-36). The macroscopic layer focuses on organizational activity systems (p. 31). The mesoscopic layer focuses on “the detailed tool-mediated structure of work” (p. 33), often related to how small groups and individuals execute routine tasks with specific tools. And the microscopic level focuses on operationalized actions, operations that “begin as conscious, goal-directed actions that are then operationalized or made automatic” (p. 34). Spinuzzi’s theory builds on theories of genre as social, community action, as system and set, and as boundary and activity system presented by Bazerman (1994, 2004), Miller (1984, 1994), and Popham (2005) among others. He recognizes the important memory role genre plays in “traditions of producing, using, and interpreting artifacts, traditions that make their way into the artifact as ‘form-shaping ideology’” (Spinuzzi 2003, 41). Regarding the practical, active role genres play, Spinuzzi notes that “people develop genres so that they can accomplish activities. As those activities change, the genres also change” (p. 42). Bakhtin (1981, 1986) contributes much to the sense of genre as “remembering” the past; this concept of genre plays an important role in identifying significant issues that keep workers from accomplishing their goals using the tools provided by central authorities (Spinuzzi 2003, 42). At each level, Spinuzzi addresses the tension between centripetal and centrifugal impulses by seeking system destablizations. At the macroscopic, or activity, level, Spinuzzi seeks contradictions between genre connections. At the mesoscopic, or action, level, he seeks discoordination within genres, groups, and/or tools. At the microscopic, or operation, level, he seeks breakdown in operationalized actions (p. 55). The rest of the text is an extended, detailed demonstration of the genre tracing methodology in action. Spinuzzi’s genre tracing methodology is a time-consuming affair that requires a great deal of field research and data analysis. However, the results are remarkable in that they identify specific, microscopic breakdowns in workflow and operationalized action that need to be addressed by information design. The resulting analysis suggests specific ways in which user innovations that overcome breakdowns can be implemented at the macroscopic, mesoscopic, and microscopic levels. The analysis provides a remarkably cogent analysis of genre contradictions that occur between GIS-centered and database-centered information designs, one that capitalizes on Bakhtin and others’ understanding of genre as encoded memory and tradition in addition to methods and innovation. And the closing chapter’s recommendation of open system design seems positively prophetic in its prediction of designs that enable, even encourage, user innovation and alteration — I created a Google Map mashup a couple of days ago using Google Maps Engine, a relatively new tool that encourages localized (centrifugal) solutions built on the framework of the centralized (centripetal) system. I found the reading enlightening and engaging, so engaging that I might recommend that members of my own team read and contemplate at least some of the chapters. The book offered remarkably cogent summaries of difficult concepts, like genre, activity theory, Bakhtin, and more. Page 41 starts a section on genre that’s positively enlightening. Bakhtin gets summarized in meaningful and highly useful ways in these pages and earlier (starting on page 20) too. Activity theory gets this tidy definition: “Activity theory posits that in every sphere of activity, collaborators use instruments to transform a particular object with a particular outcome in mind” (p. 37). There are traces of Miller and Bazerman in genre as activity and genre as system, along with traces of Popham in boundary genres. This text deserves a second read and more carefully taken notes that are searchable and scannable. Bakhtin, M. M. (1981). The dialogic imagination: Four essays. Austin, Tex: University of Minnesota Press. Bakhtin, M. M. (1986). Speech genres and other late essays. Austin, Tex: University of Minnesota Press. Bazerman, C. (1994). Systems of genre and the enactment of social intentions. In Freedman, A., & Medway, P. (Eds. ), Genre and the new rhetoric (pp. 79-104). London, UK: Taylor & Francis, Ltd.
Miller, C. R. (1994). Rhetorical community: The cultural basis of genre. In Freedman, A., & Medway, P. (Eds. ), Genre and the new rhetoric (pp. 67-78). London, UK: Taylor & Francis, Ltd. Since I am trying to keep track of the various theories that we are exploring in the class, for this week’s MindMap I added a popplet labeled “Genre Theory” that branches off from the central node labeled “Networks”. In the new node labeled “Genre Theory,” I included three brief definitions of “genre” from our readings. Branching off of the node labeled “Genre Theory” I added four new nodes labeled “Action,” “Recurrence,” “Utterance,” and “Situation”. All of these elements are central to understanding the nature of genres, and I added them so that I could further elaborate on the definitions of genre that I provided in the “Genre Theory” node. From each of these nodes (“Action,” “Recurrence,” “Utterance,” and “Situation”) I connected several new popplets to describe how they are central to genre theory. For example, one of the popplets branching from the word “Action” says “Action is guided by meaning, by perception, not by material (Miller 156). So this means that content, context, and interpretation are more important than generic form”. I found this to be a very helpful exercises because it is helping me identify the core elements of genre theory and then to explore them so that I develop a clear understanding of the basic tenants of genre theory and how they relate to one another.